Q: How do I know what size shower door I need for my opening? Ordering the correct size shower/tub door is extremely important for a proper installation. Measuring must be done after the tile or finished wall material has been installed. Check to ensure that your walls are plumb and that your shower base/tub or flat surface shower floor is level. Please refer to our “Finished Wall Dimensions” page for measuring instructions. DreamLine has many models that will work with out of plumb conditions while others are more specific and require plumb walls for installation. Please read the Product Description for out of plumb requirements for the shower door you are interested in. 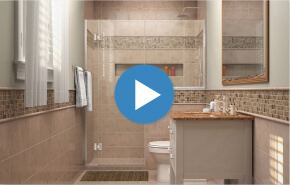 Q: Where can I purchase the plumbing fixtures or tile shown in the pictures of your shower doors? A: The plumbing fixtures and tiles shown in the pictures are not a specific manufacturer’s product and are used as graphic representations only. At this time, DreamLine does not manufacture plumbing fixtures or tile products. Q: What should I use to clean my DreamLine shower door? A: We recommend removing water with a glass squeegee or soft cloth after each use to avoid water spots. Clean your door with a soft cloth and a mild soap, such as a liquid dish soap. Do not use any abrasive or harsh cleaners. Q: What does frameless and semi-frameless mean? 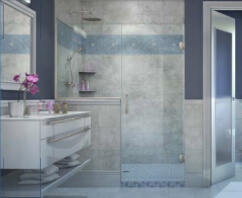 A: All of DreamLine’s shower doors are made of frameless, tempered glass panels. Shower door models with the ability to adjust for out of plumb conditions will feature a framed perimeter and are considered to be semi-frameless as the glass panels themselves, do not have frames. 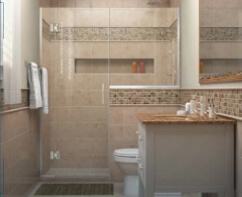 Q: What size shower base do I need for my shower enclosure? A: All of our shower enclosure models that have matching shower bases will be 2 inches smaller than the corresponding shower base to allow for proper installation. For example, if you are looking at a 34x34 inch shower enclosure, the corresponding shower base will be 36x36 inches. Q: Are your shower doors reversible? A: Most DreamLine doors are reversible. However, a few doors are specifically made for left or right installation. The products that are not reversible will specify the installation side within the specifications. Feel free to contact our Customer Support technicians with any questions you may have. 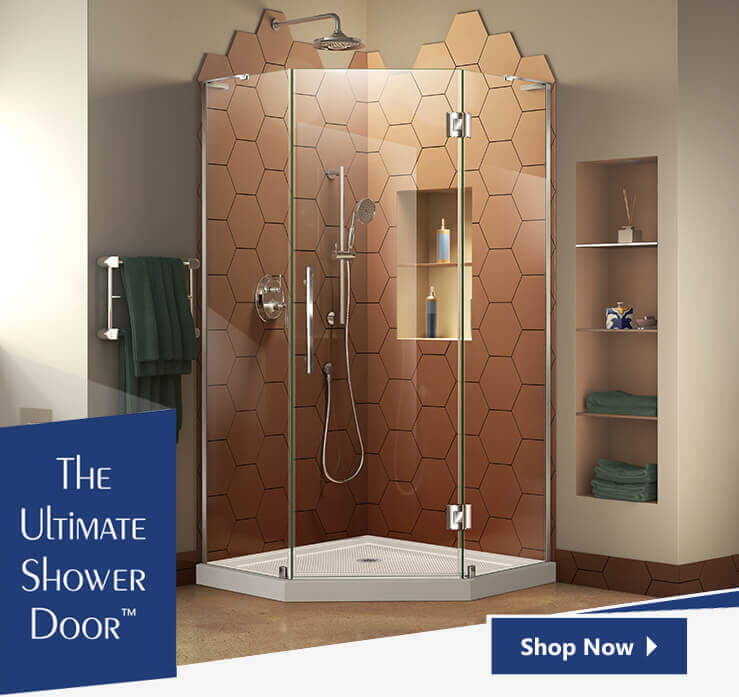 Q: Can I purchase just the hardware for this shower door? A: At this time, hardware is not available for individual sale. A: At this time, glass panels are not available for individual sale. Q: What is the difference between a pivot and a hinged shower door? A: A hinged door is attached directly to the wall or stationary glass and opens like an interior door in your house. Hinges attached directly to walls require studs behind the finished walls. A pivot door has a pivot assembly that is attached to a wall profile system that is attached to your finished wall. The pivot assembly attaches to the glass at the top and bottom much like a refrigerator door. It does not require studs behind the finished walls for installation. Q: What is a bypass sliding door? A: Two glass doors that slide to bypass each other to allow access from either the right or left of the shower space. Q: Do any of your models have a protective glass coating? A: Yes, most of our doors feature ClearMax glass protection which helps prevent the buildup of hard water and lime scale. Check out our product pages to see if ClearMax is included. Q: Will the shower base from “brand X” work with your shower enclosure? A: Most square and rectangular shower bases will work with our shower enclosures. However, DreamLine's Neo-Angle and Quarter Round shower bases are specifically designed for our Neo-Angle and Quarter Round shower enclosures. Please keep in mind that the shower base is approximately 2 inches larger than the shower enclosures. This is because your base is installed to your studs, while the shower enclosure is installed to your finished walls. Q: What are the differences between Unidoor, Unidoor Plus, Unidoor Lux, and Unidoor-X? A: The Unidoor can be a single moving glass door or a moving door and stationary glass panel combination. The moving door panel is attached to the wall with hinges and the stationary panel is attached to the wall by a wall and glass profile system. The wall profile is 2" wide and is attached to your wall. The glass profile is first attached to your glass, then you slide this panel into the wall profile. You adjust the panel to your width and plumb specifications this way. The Unidoor has the ability to be adjusted within a 1” range. The Unidoor is a semi-frameless unit. The Unidoor Plus is a moving glass door attached to the wall with hinges and a glass panel attached to the wall with a "U-Channel". The "U-Channel" is a metal frame, 1"wide and the stationary panel slides into it, giving a more frameless look than the Unidoor. The Unidoor Plus has the ability to be adjusted within a ½” range only. The Unidoor Plus is a semi-frameless unit. The Unidoor Lux is a moving glass door attached to the wall with hinges and a stationary glass panel attached to the wall with “wall brackets". Wall brackets look very similar to hinges, but they do not move. The Unidoor Lux is a completely frameless unit with no out-of-plumb adjustment. It is required that your finished opening be a whole number measurement only. Please note: The Unidoor, Unidoor Plus, and Unidoor Lux require double studs or wood blocking behind your finished wall where the door hinges will be mounted. The Unidoor-X features a glass panel, referred to as a hinged panel, mounted to the wall that the moving panel is then installed to. Depending on the size of your opening, there may be a stationary panel that the door closes to. The Unidoor-X is adjustable up to 1/2" on the stationary side, with 1/4" out-of-plumb adjustment on the hinged panel side. The Unidoor-X does not require studs behind your finished walls for installation. Q: What are the differences between Aqua, Aqua Ultra, Aqua Lux, Aqua Uno, Aqua Swing, and Aqua Fold? A: The Aqua has 1/4" thick glass. The moving door has hinges that attach to a stationary panel and the panel is attached to your wall by a wall and glass profile system. The wall profile is a 2" wide metal channel that the stationary panel slides into, making the Aqua a semi-frameless unit. The Aqua does offer the fullest range of out-of-plumb adjustment (3/8”). The Aqua Ultra has 5/16" thick glass. The moving door has hinges that attach to the stationary panel and the panel is attached to the wall with a "U-Channel". The "U-Channel" is 1" wide and the stationary panel slides into it, giving a more frameless look than the Aqua, but with only a 1/4” of out-of-plumb adjustment. The Aqua Ultra is a semi-frameless unit. The Aqua Lux has 5/16" thick glass. The moving door has hinges that attach to the stationary panel and the panel is attached to the wall with "wall brackets". The Aqua Lux is a completely frameless unit with no out-of-plumb adjustment. The Aqua Uno and the Aqua Swing are tub doors. The Aqua Uno is a single panel of glass that is attached to the wall with hinges and does not offer any out-of-plumb adjustment. The Aqua Uno opens outward. The Aqua Swing is also a single panel and is attached to the wall with a wall profile system, allowing for 3/8" out-of-plumb adjustment. The Aqua Swing is designed to open inward and outward. The Aqua Fold is DreamLine's innovative folding and pivoting door, available in both tub and shower models. The Aqua Fold features two panels that fold inward and that can then pivot outward for full access to you tub or shower. Attached to the walls with a wall profile system, the Aqua Fold has 3/8" adjustment for out-of-plumb conditions. Please enlarge the photos on your computer monitor for the models you are considering to clearly see all the features. Q: What are the differences between Enigma, Enigma-X, Enigma-XT, Enigma-XO, Enigma-Z, Enigma Air and Enigma Sky? A: The Enigma has superior 1/2" thick glass. The door has an effortless sliding operation with large quad wheel assemblies on a Stainless Steel track. The Enigma must be mounted on a solid surface or reinforced base and requires a 3 3/4” threshold. The Enigma is a completely frameless unit with no out of plumb adjustment. The Enigma-X has premium 3/8" thick glass. The door has an effortless sliding operation with large dual wheel assemblies on a Stainless Steel track. The Enigma-X requires a 2 3/4” threshold on the shower base. The Enigma-X is a completely frameless unit with no out of plumb adjustment. The Enigma-XT requires the exact installation requirements as the Enigma-X. The distinctive styling of the hardware with its Satin Black accents separates the Enigma-XT from the Enigma-X. The Enigma-XO is DreamLine's latest addition to the Enigma product family. The Enigma-XO combines Enigma-X's 3/8" thick glass and Enigma's large quad wheel assembly, while matching the installation requirements of the Enigma-X. The Enigma-Z has premium 3/8" thick glass. The "barn style" door has an effortless sliding operation with large dual wheel hardware assemblies on a Stainless Steel track. The Enigma-Z requires a 2 3/8” threshold on the shower base. The Enigma-Z is a completely frameless unit with no out of plumb adjustment. The Enigma Air has premium 3/8" thick glass. The Enigma Air features a stainless steel, square upper guide rail which imparts a cool, urban design. Like all doors in this series, the rollers offer effortless operation, there is no adjustment for out of plumb conditions, and it is able to be trimmed up to 4" for width adjustment. The Enigma Air requires a minimum threshold depth of 2 1/4". The Enigma Sky is a more recent addition to DreamLine's Enigma product family, and has the same installation requirements as the Enigma Air. The Enigma Sky also includes DreamLine's patented SafeClose and SafeStop elements for reliable and secure operation. Q: What is a wall profile, and how is it adjustable? A: A wall profile is a metal channel that the stationary panel slides into after the glass profile has been attached to it. The ability to make adjustments for width and out-of-plumb conditions comes from the depth of the wall profile and how far in you slide the stationary panel. Q: What is a U-Channel profile? A: The U-Channel is a metal channel that is 1” wide. The U-Channel system holds the stationary panel and only allows for 1/2" of width and out of plumb adjustment while offering a more frameless look. Q: Where and how do I order replacement parts? A: To order replacement parts for your DreamLine product, please contact our Customer Support Team Monday-Friday 8am-7pm and Saturday 9am-5pm EST at 1.866.731.2244 or email us at support@dreamline.com. Q: What if I have questions about installing my DreamLine shower door? A: Our Customer Support Team is ready and waiting to help! Feel free to contact us Monday-Friday 8am-7pm and Saturday 9am-5pm EST at 1.866.731.2244 or email us at support@dreamline.com. Q: How can I track an order? A: Please go to the top of the home page and click “Track Your PO” on the right. Enter your PO Number and Zip Code to locate your order. Q: How do I know if my wall is out of plumb? A: DreamLine recommends placing a 4-foot bubble level on your finished wall to check for out of plumb conditions. Q: Do your shower doors adjust for out of level threshold conditions? 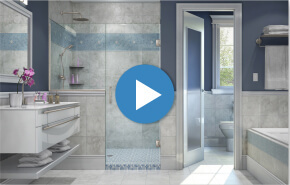 A: DreamLine shower doors have no ability to adjust for an out of level shower base or tub. Q: How are your shower doors adjustable? A: Models that have the ability to adjust for width or out of plumb will have that noted in the Product Description section of each product page. The ability to adjust for width and out of plumb is within the wall profile system or the U-Channels, depending on the model. Please read the Description field carefully for this information. Q: What are the differences between your Neo-Angle models? A: The Prism product line features 3 models with varying degrees of adjustability and installation requirements. The Prism is our pivot model that allows for 3/8" adjustment per side for out of plumb conditions and width. The Prism does not require support bars for the stationary panels. The Prism Plus is a hinged shower enclosure that allows for 1/4" adjustment on each side for out of plumb conditions. The Prism Plus comes with DreamLine's patented L-Bar support brackets for unobstructed structural support. The Prism Lux is also a hinged shower enclosure, but with no ability to adjust for out of plumb conditions. Your walls must be plumb for a successful installation of the Prism Lux. We recommend that you enlarge the photos on your computer monitor to clearly see the features and differences among the models. 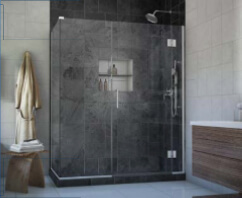 All of our Neo-Angle shower enclosures will work perfectly on a DreamLine SlimLine Neo-Angle shower base that is approximately 2" larger than the size of the shower enclosure. Q: What is DreamLine's warranty coverage? A: DreamLine provides a Limited Lifetime Manufacturer Warranty for all glass shower doors, enclosures and tub doors in Chrome, Brushed Nickel, Polished Stainless Steel and Brushed Stainless Steel. Doors and enclosures in Oil Rubbed Bronze and Satin Black come with a Limited 1-Year Manufacturer Warranty. All SlimLine shower bases come with a Limited Lifetime Manufacturer Warranty. Acrylic Backwalls come with a 1-Year Manufacturer Warranty. Warranties are constrained to the original installation and owner. More information is available on each product page. Q: How do I register my warranty? A: Please click on the link below, or scroll down to the bottom of this page and click “Warranty and Care”. It will take you to a new page where you can click “Warranty Registration” to register your DreamLine product.